Here's where you'll find results from the second day of the District 3 individual wrestling tournament, set to resume at 9 a.m. Saturday at Hersheypark Arena. Results will be updated throughout the day, so check back often. Click here to follow live multimedia updates from the action. 106 — Dalton Rohrbaugh, SG, dec. J.J. Wilson, CCl, 2-1. Jarod Loose, Hemp, dec. Josiah Gehr, Coc, 5-1. 113 — Devin Schnupp, War, maj. dec. Spencer Runshaw, Cham, 10-2. Chris Wright, CD, dec. Brandon Loperfido, Hemp, 6-4. 120 — Austin DeSanto, Ex, dec. Jose Morales, CoV, 8-5. Zurich Storm, NO, dec. Jake Cherry, CD, 9-4. 126 — Tyshawn White, CD, dec. Michael Bracey, KD, 12-6. Chandler Olson, Ship, maj. dec. Aaron Wildonger, TV, 14-4. 132 — Brett Kulp, Ex, dec. Paul Feite, NY, 1-0. Andrew Wert, CD, dec. Wyatt Long, CuV, 5-2. 138 — Owen Wherley, SW, dec. Brayden Wills, Mech, 3-0. Micah Hoffman, NY, dec. Garrett Kyner, Cham, 2-1. 145 — Cal Reichart, CuV, dec. Victor Kenderdine, MT, 5-1. Edmond Ruth, ST, dec. Matthew Danner, EP, 6-4 (SV). 152 — Jonathan Ross, NY, dec. Skitch Light, CD, 4-2. Felix Belga, CuV, dec. Gage Thomas, SW, 4-2. 160 — Bailey Shutt, LD, dec. Tommy O’Brien, Wil, 3-2. Quentin Milliken, CuV, dec. Jonah Barley, PM, 2-1. 170 — Jared Siegrist, MC, pinned Ben Root, Sol, 1:32. Jack Zimmerman, PM, dec. Trent Cook, CuV, 11-8. 182 — Josh Colello, CCl, pinned Jake Kelly, LS, 2:54. Drew Peck, Cham, dec. Evan Morrill, LD, 11-4. 195 — Jesse Kann, PM, dec. Charles Wildermuth, OV, 5-3. Dennis Karas, Ex, dec. Bryce Shields, Dt, 8-7. 220 — Cameron Tinner, Ship, tech fall Akira Bastiany, Mech, 2:16 (15-0). J’Michael Wedderburn, Her, dec. Ben Fromm, Coc, 6-4. 285 — Blaine Yinger, Ne, dec. Isaac Schannauer, Wil, 1-0. Oscar Daniels, Ex, dec. Ryan Stewart, War, 7-2. 106 — Rohrbaugh, SG, dec. Loose, Hemp, 3-2. 113 — Schnupp, War, dec. Wright, CD, 2-1. 120 — DeSanto, Ex, dec. Storm, NO, 13-6. 126 — White, CD, dec. Olson, Ship, 8-3. 132 — Kulp, Ex, dec. Wert, CD, 2-1. 138 — Wherley, SW, dec. Hoffman, NY, 7-4. 145 — Ruth, ST, dec. Reichart, CuV, 3-2. 152 — Ross, NY, dec. Belga, CuV, 7-5 (TB2). 160 — Shutt, LD, dec. Milliken, CuV, 3-2. 170 — Siegrist, MC, dec. Zimmerman, PM, 10-6. 182 — Colello, CCl, dec. Peck, Cham, 8-4. 195 — Kann, PM, dec. Karas, Ex, 7-5. 220 — Tinner, Ship, maj. dec. Wedderburn, Her, 10-2. 285 — Yinger, Ne, dec. Daniels, Ex, 4-2 (SV). 106 — Seth Runshaw, Cham, dec. Mitchell Arch, CD, 8-6. Brandon Connor, Wil, maj. dec. Matthew Rodriguez, Do, 12-2. 113 — Brandon Rodriguez, Do, pinned Samuel Zummo, DB, 0:55. Michael Cassidy, CCl, dec. Ryan Watts, Ex, 3-1. 120 — Chase Mowery, SW, dec. JD Barrick, CuV, 1-0. Josh Paisley, BiS, dec. Dalton Daugherty, Dt, 7-5. 126 — Aaron Rump, Cham, dec. Gabe Ikeda, CCl, 5-2. Zack Zeamer, MC, dec. James Harkness, Ex, 2-1. 132 — Joe Pecaitis, Get, dec. Xavier Musti, CY, 8-2. Tucker Brough, BiS, dec. Pavel Dariychuk, CoV, 5-2. 138 — Owen Powell, DB, dec. Allen Arentz, GM, 7-2. Will Kaldes, CuV, dec. Joey Davis, Sol, 3-2. 145 — Dylan Chatterton, CY, dec. Zach Scheetz, GM, 7-0. Wyatt Jennings, Sol, dec. Chase Mueller, Get, 4-0. 152 — Nolan Poust, NO, pinned Tyler Bagoly, Ex, 3:10. Tyler Davis, Read, dec. Keaton Eidle, Wil, 3-2 (TB2). 160 — Phil Petrina, CD, dec. Drake Pew, Dt, 12-7. Tyler Reber, Hemp, dec. Brittain Shields, BiS, 6-4 (SV). 170 — Koltyn Eason, CD, dec. Ben Maack, GM, 7-2. Jake Koser, NY, dec. Chance Rayhart, BiS, 8-2. 182 — Jarell Howard-Griffin, CCr, dec. Jake Schalles, CuV, 7-2. Isaiah Dickson, CY, dec. Blake Barrick, BiS, 4-2. 195 — Hunter Harnish, LD, dec. Devin Evans, ST, 8-6 (SV). Dylan Harr, GM, pinned Eugene Rodgers, Mech, 2:17. 220 — Jesse Enck, DB, dec. Leo Higgins, Pal, 3-1 (SV). Muhamed Alic, Car, dec. Nate Young, SG, 10-7. 285 — Michael Wolfgram, CY, dec. Noah Smith, NY, 3-2. Brock Hartman, NO, pinned Brady Maxwell, Coc, 0:55. 106 — Wilson, CCl, tech fall Runshaw, Cham, 4:39 (15-0). Gehr, Coc, dec. Connor, Wil, 7-0. 113 — Rodriguez, Do, dec. Runshaw, Cham, 6-2. Loperfido, Hemp, maj. dec. Cassidy, CCl, 13-1. 120 — Morales, CoV, dec. Mowery, SW, 7-2. Cherry, CD, dec. Paisley, BiS, 1-0. 126 — Rump, Cham, dec. Bracey, KD, 1-0. Wildonger, TV, dec. Zeamer, MC, 4-1. 132 — Feite, NY, dec. Pecaitis, Get, 4-0. Long, CuV, dec. Brough, BiS, 4-1. 138 — Wills, Mech, pinned Powell, DB, 0:54. Kaldes, CuV, dec. Kyner, Cham, 3-1 (TB2). 145 — Chatterton, CY, dec. Kenderdine, MC, 9-2. Jennings, Sol, dec. Danner, EP, 9-2. 152 — Poust, NO, dec. Light, CD, 7-5. Thomas, SW, dec. Davis, Read, 5-4. 160 — O’Brien, Wil, maj. dec. Petrina, CD, 9-0. Barley, PM, dec. Reber, Hemp, 4-1. 170 — Eason, CD, dec. Root, Sol, 7-0. Cook, CuV, dec. Koser, NY, 9-6. 182 — Howard-Griffin, CCr, dec. Kelly, 2-1 (UTB). Morrill, LD, dec. Dickson, CY, 6-4 (SV). 195 — Wildermuth, OV, def. Harnish, LD, 0:35. Harr, GM, dec. Shields, Dt, 5-1. 220 — Enck, DB, pinned Bastiany, Mech, 3:27. Alic, Car, dec. Fromm, Coc, 5-1. 285 — Schannauer, Wil, dec. Wolfgram, CY, 4-3. Stewart, War, dec. Hartman, NO, 6-2. 106 — Wilson, CCl, dec. Gehr, Coc, 5-4. 113 — Loperfido, Hemp, dec. Rodriguez, Do, 5-0. 120 — Cherry, CD, dec. Morales, CoV, 4-2 (SV). 126 — Wildonger, TV, def. Rump, Cham, forfeit. 132 — Long, CuV, dec. Feite, NY, 5-1. 138 — Kaldes, CuV, maj. dec. Wills, Mech, 16-4. 145 — Chatterton, CY, dec. Jennings, Sol, 5-4. 152 — Thomas, SW, dec. Poust, NO, 6-5. 160 — Barley, PM, dec. O’Brien, Wil, 3-1. 170 — Eason, CD, dec. Cook, CuV, 6-4 (SV). 182 — Howard-Griffin, CCr, dec. Morrill, LD, 4-2. 195 — Harr, GM, dec. Wildermuth, OV, 4-0. 220 — Enck, DB, pinned Alic, Car, 2:06. 285 — Schannauer, Wil, dec. Stewart, War, 3-0. 106 — Connor, Wil, dec. Runshaw, Cham, 5-4 (SV). 113 — Cassidy, CCl, pinned Runshaw, Cham, 4:39. 120 — Paisley, BiS, dec. Mowery, SW, 4-0. 126 — Bracey, KD, dec. Zeamer, MC, 8-2. 132 — Brough, BiS, dec. Pecaitis, Get, 6-0. 138 — Kyner, Cham, dec. Powell, DB, 3-2. 145 — Danner, EP, maj. dec. Kenderdine, MT, 14-6. 152 — Light, CD, dec. Davis, Read, 6-4. 160 — Reber, Hemp, dec. Petrina, CD, 3-1. 170 — Koser, NY, dec. Root, Sol, 10-4. 182 — Kelly, LS, dec. Dickson, CY, 2-0 (SV). 195 — Shields, Dt, def. Harnish, LD, forfeit. 220 — Bastiany, Mech, maj. dec. Fromm, Coc, 9-1. 285 — Wolfgram, CY, dec. Hartman, NO, 3-0. Team Standings and key — 1. Central Dauphin (CD) 122. 2. Cumberland Valley (CuV) 119.5. 3. Exeter Township (Ex) 105.5. 4. Northern York (NY) 73. 5. Penn Manor (PM) 64. 6. Chambersburg (Cham) 59.5. 7. Cedar Cliff (CCl) 57. 8t. Lower Dauphin (LD) Wilson (Wil) 53. 10. New Oxford (NO) 51. 11. South Western (SW) 59. 12. Hempfield (Hemp) 47.5. 13. Shippensburg (Ship) 46. 14. Spring Grove (SG) 44. 15. Manheim Central (MC) 43.5. 16. Daniel Boone (DB) 37. 17t. Central York (CY) Warwick (War) 36. 19t. Big Spring (BiS) Solanco (Sol) 33. 21. Cocalico (Coc) 32. 22. Governor Mifflin (GM) 30.5. 23. Mechanicsburg (Mech) 29. 24. Susquehanna Township (ST) 25. 25t. Dallastown (Dt) Hershey (Her) Twin Valley (TV) 21. 28. Cedar Crest (CCr) Dover (Do) 20. 30t. Conestoga Valley (CoV) Northeastern (Ne) 18. 32. Oley Valley (OV) 14. 33t. Carlisle (Car) Gettysburg (Get) 11. 35t. East Pennsboro (EP) Kennard-Dale (KD) 10. 37. Lampeter-Strasburg (LS) 9. 38. Manheim Township (MT) 8. 39. Reading (Read) 7. 40t. Milton Hershey (MH), Palmyra (Pal), Red Land (RLa) 6. 43. J.P. McCaskey (JPM) 4. 44. Garden Spot (GS) 3.5. 45. Harrisburg (Har) 3. 46t. Ephrata (Eph), Susquehannock (Sus) 2. 48. Red Lion (RL) 1. 49t. Central Dauphin East (CDE), Donegal (Don), Middletown (Mid), Waynesboro (Way), West Perry (WP), West York (WY) 0. 106 — Caleb Bentley, Trin, dec. Landon West, BeS, 4-0. Chase Shields, McD, tech fall Mason Kauffman, New, 3:52 (20-5). 113 — Kollin Myers, BoS, maj. dec. Dustin Breidegan, NL, 10-2. Bronson Garber, UD, dec. Luke Pipa, McD, 5-4. 120 — Austin Clabaugh, BeS, dec. Tanner Ball, PV, 7-1. Joe Lobeck, LC, dec. Jalin Hankerson, BoS, 6-2. 126 — Caleb Garland, Han, pinned Jethro Solomon, SV, 3:30. Gabe Miller, PV, dec. Tristan Hanshaw, BoS, 3-2. 132 — John Pipa, McD, pinned Jarod Miller, BeS, 1:20. Trevor Leonard, NL, maj. dec. Cameron Palmer, BoS, 13-2. 138 — Cole Wetzel, BoS, maj. dec. Jayden Johnson, McD, 12-1. Josh Renninger, AC, pinned Darren Beall, BeS, 1:40. 145 — AJ Kostyak, BoS, dec. Carl Harris, Lt, 8-5. Scott Cooper, Big, dec. Austin Fisher, PV, 2-1. 152 — Nate Newberry, Big, pinned Daniel Wanner, PV, 3:41. Brian Shermeyer, DC, dec. Hunter Gimbor, BH, 1-0. 160 — Dalton Group, Susq, pinned Teddy Limberiou, SV, 0:46. Travis Wickard, BoS, pinned Luis Negreiros, NL, 5:56. 170 — Dakota Mackley, EY, dec. Colten Drawbaugh, Trin, 3-1. Quinn Blatt, NL, pinned Noah Fleshman, BeS, 4:47. 182 — Luke Funck, NL, tech fall Austin Taylor, BoS, 4:17 (16-1). 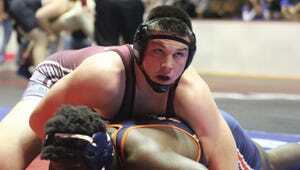 Connor Geiman, Lt, dec. Jarryd Kase, Kutz, 6-0. 195 — Sam Teeter, CH, pinned George Limberiou, SV, 0:31. Brady Herr, New, pinned Hunter Wallace, NL, 3:14. 220 — Matt Vines, NL, def. Matt Guilday, Lt, injury default, 3:20. Rickie Ott, BoS, dec. Jakob Paul, Hal, 1-0. 285 — Robert Dunbar, Wyo, dec. Brady Linebaugh, BeS, 3-2 (TB2). George Thompson, NL, dec. Bryce Perkins, DC, 6-1. 106 — Shields, McD, dec. Bentley, Trin, 2-1 (TB2). 113 — Myers, BoS, dec. Garber, UD, 5-2. 126 — Garland, Han, maj. dec. Miller, PV, 14-3. 132 — Pipa, McD, dec. Leonard, NL, 5-2. 138 — Wetzel, BoS, maj. dec. Renninger, AC, 12-3. 145 — Kostyak, BoS, dec. Cooper, Big, 3-1. 152 — Newberry, Big, maj. dec. Shermeyer, DC, 16-5. 160 — Group, Susq, dec. Wickard, BoS, 8-2. 170 — Blatt, NL, maj. dec. Mackley, EY, 16-4. 182 — Funck, NL, pinned Geiman, Lt, 0:46. 195 — Herr, New, pinned Teeter, CH, 3:34. 220 — Vines, NL, pinned Ott, BoS, 1:09. 285 — Dunbar, Wyo, dec. Thompson, NL, 2-1. 106 — Shane Strausser, Ham, pinned Andrew Knobloch, DC, 2:25. Kyle Anspach, NL, pinned Jake Sharadin, Kutz, 4:19. 113 — Jacob Coniglio, CH, maj. dec. Hayden Funck, AC, 12-0. Isaiah Bryner, New, maj. dec. Owen Deturk, Ham, 16-4. 120 — Zach Rupp, UD, dec. Connor Yourkavitch, Wyo, 11-4. Colin Leonard, NL, maj. dec. Jordon Frey, New, 15-2. 126 — Aaron Finicle, New, pinned Corbin Brown, Lt, 0:54. Kyle Caskie, BH, maj. dec. Tyler Wright, UD, 10-1. 132 — Chase Drawbaugh, Trin, maj. dec. Ryan Hart, DC, 12-1. Kyle Dimovitz, SV, dec. Gus Latorre, CH, 5-3. 138 — Evan Hoffman, UD, pinned Dylan Miller, Ham, 2:12. Zach Kelly, NL, dec. Cory Becker, Lt, 4-2 (SV). 145 — Ashton West, BeS, def. Brenden Quinn, DC, forfeit. Steve Herb, NL, pinned Michael Capozzoli, New, 1:45. 152 — Colby Stroup, New, dec. Matt James, Ham, 7-6. Blaise Bressler, NL, pinned Lucas Gladfelter, BeS, 1:17. 160 — Conner Barshinger, EY, pinned Zachary Hart, DC, 0:57. Barry Carter, McD, dec. Justin Barnes, Han, 3-2. 170 — Tita Nyambi, CH, dec. Kevin Kenny, Susq, 7-2. Cade Wilbert, Hal, pinned Mark Wagner, AC, 3:00. 182 — Colton Sentz, Big, dec. Jahshim Snyder, EY, 3-1. Brady Repasky, DC, tech fall Nate Teeter, CH, 2:48 (16-0). 195 — Logan Luckenbaugh, BeS, pinned Austin Strunk, Ham, 1:44. Victor Lopez, Big, dec. Donny Gelnett, UD, 5-4 (UTB). 220 — Cole Nye, McD, maj. dec. Damian Rodriguez, DC, 14-4. Brandon Tomeo, CH, pinned Walker Klinger, New, 2:49. 285 — Michael Hubble, BH, pinned Cole Freeland, Col, 3:00. Dalton Gromlich, Ham, pinned Brandon Light, AC, 2:39. 106 — West, BeS, dec. Strausser, Ham, 6-2. Anspach, NL, dec. Kauffman, New, 6-4. 113 — Coniglio, CH, dec. Breidegan, NL, 4-1. Pipa, McD, dec. Bryner, New, 5-0. 120 — Ball, PV, dec. Rupp, UD, 6-2. Hankerson, BoS, tech fall Leonard, NL, 3:52 (17-2). 126 — Solomon, SV, dec. Finicle, New, 6-5. Hanshaw, BoS, dec. Caskie, BH, 4-1. 132 — Drawbaugh, Trin, dec. Miller, BeS, 11-5. Palmer, BoS, dec. Dimovitz, SV, 5-3 (TB2). 138 — Johnson, McD, dec. Hoffman, UD, 7-1. Kelly, NL, dec. Beall, BeS, 7-2. 145 — West, BeS, dec. Harris, Lt, 3-2. Fisher, PV, dec. Herb, NL, 5-2. 152 — Wanner, PV, dec. Stroup, New, 5-2. Gimbor, BH, maj. dec. Bressler, NL, 13-2. 160 — Limberiou, SV, pinned Barshinger, EY, 1:34. Carter, McD, dec. Negreiros, NL, 2-1 (SV). 170 — Nyami, CH, dec. Drawbaugh, Trin, 8-3. Fleshman, BeS, dec. Wilbert, Hal, 6-2. 182 — Taylor, BoS, dec. Sentz, Big, 7-0. Repasky, DC, dec. Kase, Kutz, 4-3. 195 — Luckenbaugh, BeS, pinned Limberiou, SV, 2:55. Wallace, NL, dec. Lopez, Big, 9-3. 220 — Nye, McD, inj. Def. Guilday, Lt. Paul, Hal, maj. dec. Tomeo, CH, 9-1. 285 — Linebaugh, BeS, pinned Hubble, BH, 1:30. Perkins, DC, dec. Gromlich, Ham, 5-3. 106 — West, BeS, dec. Anspach, NL, 9-4. 113 — Pipa, McD, maj. dec. Coniglio, CH, 9-0. 120 — Hankerson, BoS, dec. Ball, PV, 5-1. 126 — Solomon, SV, dec. Hanshaw, BoS, 7-6. 138 — Kelly, NL, pinned Johnson, McD, 1:38. 145 — Fisher, PV, dec. West, BeS, 6-4. 152 — Gimbor, BH, dec. Wanner, PV, 5-1. 160 — Limberiou, SV, pinned Carter, McD, 2:07. 170 — Fleshman, BeS, dec. Nyambi, CH, 1-0. 182 — Taylor, BoS, maj. dec. Repasky, DC, 8-0. 195 — Luckenbaugh, BeS, pinned Wallace, NL, 1:20. 220 — Nye, McD, dec. Paul, Hal, 5-2. 285 — Linebaugh, BeS, dec. Perkins, DC, 2-1. 106 — Strausser, Ham, pinned Kauffman, New, 2:10. 113 — Bryner, New, dec. Breidegan, NL, 1-0. 120 — Rupp, UD, dec. Leonard, NL, 13-11 (SV). 126 — Caskie, BH, dec. Finicle, New, 11-9 (SV). 132 — Dimovitz, SV, dec. Miller, BeS, 2-0. 138 — Beall, BeS, pinned Hoffman, UD, 1:45. 145 — Harris, Lt, dec. Herb, NL, 7-4. 152 — Bressler, NL, dec. Stroup, New, 6-2. 160 — Negreiros, NL, dec. Barshinger, EY, 8-4. 170 — Drawbaugh, Trin, dec. Wilbert, Hal, 5-2. 182 — Sentz, Big, dec. Kase, Kutz, 5-1. 195 — Lopez, Big, dec. Limberiou, SV, 3-1 (SV). 220 — Tomeo, CH, def. Guilday, Lt, medical forfeit. 285 — Gromlich, Ham, pinned Hubble, BH, 1:23. Team Standings (and key) — 1. Northern Lebanon (NL) 198.5. 2. Boiling Springs (BoS) 158.5. 3. Bermudian Springs (BeS) 119. 4. Bishop McDevitt (McD) 82. 5. Newport (New) 82. 6. Camp Hill (CH) 66. 7. Biglerville (Big) 63. 8. Delone Catholic (DC) 57. 9. Pequea Valley (PV) 54.10. Hamburg (Ham) 52. 11. Upper Dauphin (UD) 50. 12t. Brandywine (BH), Schuylkill Valley (SV) 44. 14. Littlestown (Lt) 42.5. 15. Trinity (Trin) 39. 16. Annville-Cleona (AC) 36. 17. Susquenita (Susq) 35. 18t. Halifax (Hal), Hanover (Han) 30. 20t. Eastern York (EY), Wyomissing (Wyo) 29. 22. Lancaster Catholic (LC) 22. 23. Kutztown (Kutz) 10. 24. Columbia (Col) 7. 25t. Fairfield (F), Tulpehocken (Tulp) 0.